JERUSALEM (Ma’an) — Israeli forces detained more than 1,900 Palestinians from occupied East Jerusalem in 2015, the majority of whom were minors, a prisoners’ rights group said on Sunday. 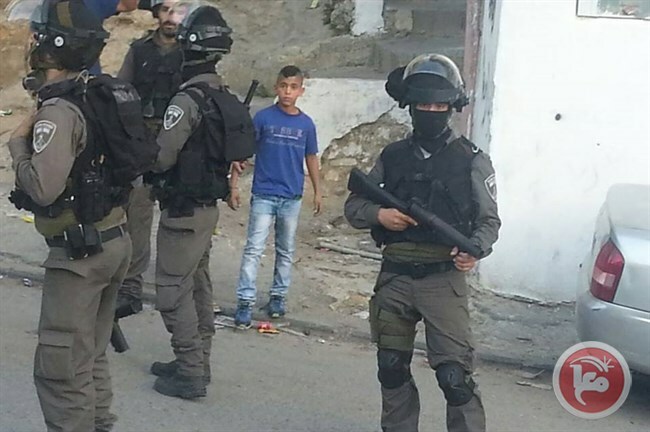 A spokesman for the Palestinian Prisoners’ Center for Studies, Riyad al-Ashqar, said in a statement that around two-thirds of those detained from the occupied city were minors, 65 of whom were put under house arrest. Israeli authorities launched a series of new measures in November in response to an increase in unrest in occupied East Jerusalem that had escalated in the months prior. Included in the measures was a bill approved by the Israeli Ministerial Committee for Legislation that enables minors from 12 years of age to be given custodial sentences for committing “nationalistically-motivated” crimes. Following the approval, prisoners’ rights group Addameer said that children convicted of such crimes would not actually serve the sentences until reaching the age of 14, as current criminal law in Israel prohibits custodial sentences against children under 14. The group reported that the Knesset — Israel’s parliament — meanwhile changed an existing national insurance law to enable authorities to remove social benefits provided to children convicted of “nationalistic-motivated” offenses and “terrorist activities” while they served time in prison. Israeli juvenile courts were also granted the ability to charge families of children convicted of such crimes fines of up to 10,000 shekels (US$2,580). The Israeli government and Israeli Prime Minister Benjamin Netanyahu in particular came under heavy fire in July when the Knesset passed a law allowing stone-throwers to receive a 20-year prison sentence where intent to harm could be proven, and 10 years where it could not. Critics argued the law would be implemented solely to crack down on Palestinian youth in occupied East Jerusalem who frequently clashed with Israeli forces. Since tensions heightened in October and clashes between Palestinian youth and Israeli forces became near-daily in Jerusalem, Addameer reported that the Israeli Prison Service had opened a new juvenile section at Givon prison to accommodate for the mass spike in detention of Palestinian minors. Conditions in the prison documented by Defense for Children International – Palestine (DCIP) have since failed to meet international standards, with children detainees reportedly denied family visitation and forced into solitary confinement. Both Addameer and DCIP following the increase in detention of Palestinian children in the final months of 2015 called on Israel to implement laws equally against Palestinian and Jewish Israeli youth.